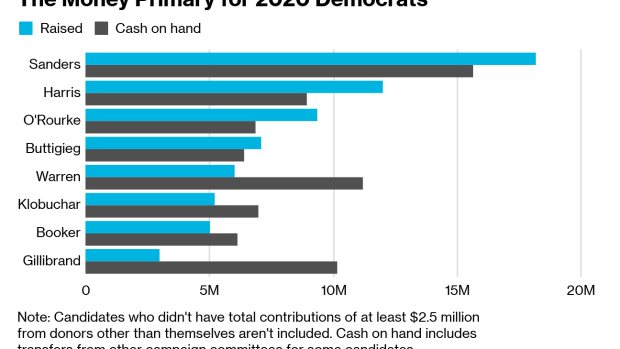 (Bloomberg) -- Fundraising totals for 2020 candidates show the advantage of being an incumbent president -- and the challenge for Democrats, who are raising less money and still have to compete among themselves before taking on Donald Trump. Democrats face a series of expensive nominating contests early next year, while Trump -- whose approval ratings are well below 50 percent -- has the luxury of focusing on building a war chest for the general election -- still more than 18 months away. Trump’s committees raised $21.4 million from donors giving $200 or less in the first quarter, or 56 percent of the total. His campaign uses frequent texts and emails to rally his base on issues ranging from building a border wall to attacking Special Counsel Robert Mueller’s investigation of Russian interference in the 2016 election, while asking for a contribution -- sometimes as little as $3. "He’s been raising money nonstop since 2016," said Dan Eberhart, chief executive officer of oil services firm Canary Drilling Services LLC and a leading GOP donor. "That early commitment has given him a huge edge over Democrats." Combined, Trump’s committees spent $3 million on direct mail, $2.6 million on online advertising and subscriptions, $1.6 million on legal consulting and $1.5 million on Trump branded merchandise -- the hats, t-shirts, buttons, stickers and other paraphernalia used to lure small dollar donors, his filings show.